NetNewsLedger - Thank You Thunderwolves! 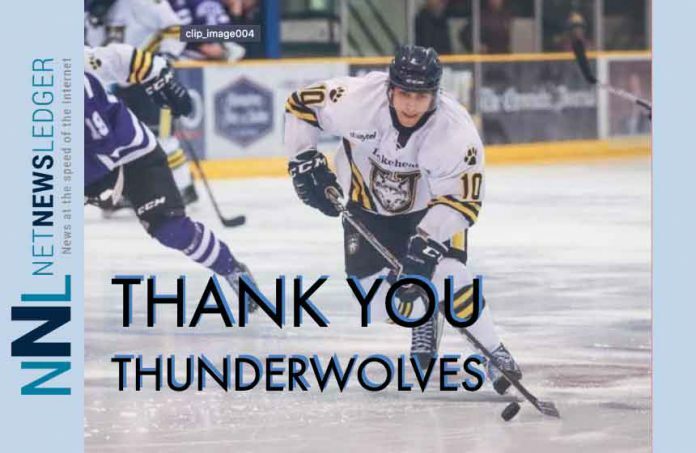 Home Sports Local Sports Thank You Thunderwolves! 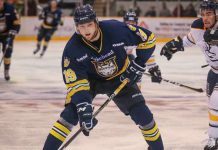 LONDON – The Lakehead Thunderwolves downed the Western Mustangs 5-1 at Thompson Arena on Saturday afternoon to finish up the 2018-19 season on a high note. Lakehead’s Jordan King got the only goal of a fast-moving first period when he dented the twine behind Western goalie David Oskjannikov at 14:20, with Daniel Del Paggio and Brennen Dubchak assisting. Austin McDonald scored an unassisted goal when he burned a Western defenceman and then went top shelf with a backhander at 6:07 of the second period. Dillon Donnelly wired a slap shot from the point to put the Wolves up 3-0 on a Lakehead power play at 13:22, with Del Paggio and Josh Laframboise getting the helpers. Thunderwolves’ netminder Devin Green wasn’t as busy as the night before, but came up with some big saves when called upon to keep the Mustangs off the board after 40 minutes of play. Green continued his strong play and stopped Western’s Trevor Warnaar on back-to-back breakaway attempts early in the third to keep the Mustangs from gaining any momentum. Matt Alexander put a move an a Western d-man and fired low from the right hash mark to put Lakehead up 4-0 while the Wolves held the man advantage at 8:56, with the assist going to Dylan Butler. Alex DiCarlo broke Green’s shutout bid when he skated in alone and beat him low on the glove side with 3:39 remaining in the contest. Lakehead added another power play marker to round out the scoring when Sam Schutt tipped Alexander’s point shot past Oskjannikov at 18:11, with Dubchak getting another helper. Total shots on goal in the game were 25-22 for the Thunderwolves. Lakehead’s power play was very effective as the Wolves went 3-for-4 with the man advantage, while the Mustangs were 0-for-2. The victory gives Lakehead an OUA record of 12-15-1 (18-16-1 overall), as the Wolves finish the regular season in ninth place, just one point back of eighth for the final playoff spot in the West Division. 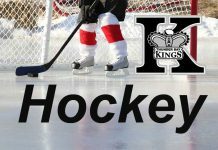 Thank-you to all the fans, all the NNL readers and of course all the team members of the Thunderwolves for an entertaining hockey season. For the team members and coaches, thank-you for all that you do in our community. Previous articleIf you “Always have Time” – Why No Time to Clean Up?